A small table sits in the middle of the room: a table littered with papers, a tiny terrarium, pencils, more papers, an open book, and something that resembles a horn used as a primitive sound-amplifying device. A golden crown inlaid with round turquoise stones (probably actual turquoise) sits precariously near the edge of the table. In a nicely cushioned chair right next to the table sits the owner of the crown, the book, the papers and everything else: a young female Royal Bori. She looks just like a typical Royal Girl Bori, minus the crown, and her long teal braid is wrapped into a messy bun haphazardly held into place with several pencils. She has an open notebook on her lap, another pencil in her right hand, and a magnifying glass in her left. Her head is bent down toward the table, listening to something in the sound amplifying device. "This is absolutely fascinating," she murmurs, jotting something down in the notebook, and then notices that she has a visitor. "Ah, good day, fellow Neopian!" She nods to you. "My name is Vidya, and I am about to interview a Larnikin to learn more about its life inside of the terra-Habitarium. I have taken it out of the Habitarium in order to interview it. Since the Larnikin is very small, I am using a magnifying glass and sound amplification to be able to see and hear it properly." She pauses to look at the tiny creature with the magnifying glass. "And do not ask how it has learned to speak our tongue. That would be far too difficult to explain, and I am certain that you would not understand the process, anyway. The Larnikin speaks into the device, and it amplifies its voice loud enough for us to hear—but you must be close in order to hear it at all, so please come join me." Vidya motions to a chair on the other side of the small table. "Take a seat." "I have just finished testing the equipment, so we are ready to begin the interview." Vidya looks down at her notebook, then at the Larnikin. "To begin, what is your name?" "Name?" The tiny voice in the amplifier sounds confused. "What's that?" Vidya picks up her magnifying glass and looks at the Larnikin with concern. "What do others call you?" "...I will call you 'Larny' for the sake of simplicity." Vidya jotted something down into her notebook. "What is life like inside the Habitarium?" The Larnikin's tone is very cheerful. "It's great! I'm a worker, and I think I've got it the easiest of all. I work, rest, eat, work some more, rest some more, eat some more, then work, eat, and then rest, and then I do some work, rest for a while, and then eat." "...That sounds terribly boring, actually." Vidya makes another note. "Do you actually do anything in those houses and hospitals?" "Oh, yeah. We don't just sleep, you know. We have an unlimited stock of the best gourmet food, libraries that would rival the ones in Faerieland and Brightvale, and more toys than you could possibly count. 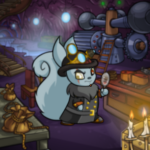 They're so tiny that regular Neopians can see them only through a microscope. Our hospitals have an infinite supply of the best medicine available. That's why we heal so quickly!" Vidya begins to make a note, but then she suddenly frowns in confusion and picks up the magnifying glass to focus on the Larnikin again. "Libraries? Can you actually read?" "They're all picture books! No words at all!" "That makes more sense. Sort of." Vidya puts the magnifying glass down onto the table and resumes writing in her notebook. "And to think that on average, you petpetpets live for just a week, correct? It seems like you are quite pampered..."
"Haha, yeah, I guess we are! Never thought of that before!" Larny's tone seems much too cheery. "Let us move on. This is a very... strange question, perhaps, but I shall ask it anyway: Have you ever considered what a petpetpetpet would be like?" There's a pause. "A, uh... what?" The Larnikin sounds confused. "A petpetpetpet. A pet for you petpetpets." "Oh! I get it now. Well, I knew a Mootix who tried to keep water molecules as pets. I think petpetpetpets would be kinda like that. It didn't work out for the Mootix, though... Those water molecules somehow managed to escape and flooded part of the Habitarium!" "...Yes, I see that could be a problem. My next question is... uh... Oh dear, I think someone inserted a joke question in here." Vidya frowns again as she turns the page in her notebook. "Well, I shall ask it anyway! Why... why do you Larnikins look so much like jellybeans?" Another pause. "We do? I never thought of that before. I don't know, but I am suddenly hungry for berry jelly!" "I suppose that would follow." Vidya smiles and shakes her head while she makes another note in her book. "Why are you Larnikins, and Pinchits and Mootixes, for that matter, so rare outside of the Habitarium?" Larny's answer is immediate, and its voice seems to be a little louder. "It's because that Kougra professor, what's-his-name..."
"Yes, him! He captures us to cage us up! That's why there aren't many of us outside of the Habitarium! I guess if you're really bored and really want to attach us to a petpet, you could try to drag us out of the Habitarium, but that'll never work and it will make you look kinda, uh... weird, to say the least. So don't try it." "That got quite a reaction out of you." Vidya spends several moments writing in her notebook, then picks up the magnifying glass again to take a good look at Larny. "What are your thoughts on Dr. Clodbottle?" "He's crazy!" Larny is standing up just enough to be able to gesture with its first two legs, using them as arms. It waves these "arms" wildly as it speaks. "He obsesses over us petpetpets—or P3s, as he calls us—all day and all night, and, and I said before, even captures some of us to put into terrariums so others can help him with his research! Isn't that pretty crazy!?" "He has made his research into a popular game. And you lead very nice lives, it seems. Exactly how crazy do you think he is?" "I don't know. I've never seen his notes or anything. I can't read, remember?" Larny shrugs. "But he stares at us all the time and takes... notes... like you're doing, right now!" Larny gasps. "Are you...!?" "No, I am not working for him," Vidya says quickly, again picking up the magnifying glass to focus on Larny. She fumbles with it and ends up bumping the table, causing the crown to fall off and clatter to the floor. "I am doing independent research, I assure you. There is nothing to fear. I hardly know Dr. Clodbottle!" "What was that?" The Larnikin seems to have suddenly forgotten the conversation and is looking around wildly. "That noise? A pest attack!?" "No, I knocked my crown to the floor. I took it off because it did not quite fit right, and now... it is on the floor. I shall pick it up later." Vidya puts down the magnifying glass to take more notes, murmuring under her breath as she writes. "Apparently this P3 is not fond of Dr. Clodbottle... I never would have anticipated that." Once she's finished, she picks up the magnifying glass again. "What about Professor Hugo Fairweather? Have you heard of him?" "He is an old Tonu, a university professor, who claims to have found an island full of giant petpetpets a few years ago." "Ooooohhh... Never heard of him, but I like that idea!" Larny claps his "arms" together and rubs them. "I would love to see that, if I live long enough, of course." "I wish you the best on that. I have one more question for you, Larny. I am not sure if you know anything about this, but... Do you happen to know anything about the bug infestation on Roo Island and the new Games Room?" "Nope! I just know that everyone in the Habitarium thinks that stuck-up Blumaroo's been really crazy to keep running it even when it's obviously full of bugs!" "I think many of us feel the same way. Thank you for your time, Larny. Now, my crown... Oh, I am certain it fell over here," Vidya puts her notebook and pencil on the table as she glances around the nearby floor for her crown. "It is not here! Where could it have gone? Perhaps it rolled or slid over there..."
Laerya and Akorri had been traveling together for several days now. Lae, the Cybunny, had recently started learning magic – she'd taken an interest in the element of light, but her ability was limited. "Who's they? And who's Dr. Sloth? And what's Neopia?" Tinost said, echoing my own confusion. Lapnia stared at us. "Are you two for real?" Andy & Baxter #2 - We have the day off today! So let's go to an adventure!